There’s a lot of talk about Federal Reserve Chairman Ben Bernanke managing a “soft landing” of ending stimulus and quantitative easing. Time will be the judge. It’s interesting to compare this “soft landing” to the last one -where instead of government stimulus it was housing that had reached bubble proportions. What did Bernanke say back then? “Our assessment at this point … is that this looks to be a very orderly and moderate kind of cooling,” Bernanke said. My assessment is that the Fed’s assessment was downright terrible. Peer Lending Advisors facilitates investors getting access to the Peer-to-Peer Lending Market and would love to work with you. Looking to Invest in Lending Club or Prosper and want expert help and advice? Peer Lending Advisors is a full service investment advisory firm and can help you get started investing in Peer-to-Peer Loans and manage your portfolio. Peer Lending Advisors has been investing in the Peer-to-Peer Lending market since 2007 and is the only Investment Advisory focused 100% on P2P Loans. Send an email or call 425-246-5436), or fill out the form below for more information. 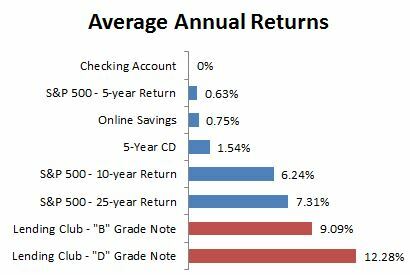 Chasing high returns (that come with high risk) is a common mistake that investors make when interest rates are artificially low. This was observed during the housing bubble, when many investors were steered to mortgage-backed securities and subprime credit products, which did have higher returns, but also came with very high risk. Those investments did not turn out well when the housing bubble popped, to put it mildly. Another example during the housing bubble was Auction Rate Securities – Long term bonds that were sold to investors as safe-as-cash, but actually carried high liquidity risk. How do you ensure your portfolio is safe even if a deep recession hits? There are no guarantees. However Peer Lending Advisors works with you to create a portfolio for good times and for bad. Interested in working with us to create a portfolio of Peer-to-Peer Loans? Back when I worked for Capital One, I was given a short term assignment to join a team of fellow business analysts and statisticians to rebuild one of our Subprime credit models. We used tools like SQL, SAS, and CART to identify the variables that were most highly correlated with payments, profit, and losses. While the math work was pretty individualistic, we often consulted with each other to check our intuition and ensure we were building a robust model. We kicked off the project with a team meeting, and we had a very strong team. Gary lead the team – he was eagerly anticipating a promotion, and was hoping that leading this project would solidify his chances at the next review period. HJ was the lead statistician. I had worked with her before on a collections and recoveries model and she was fantastic to work with – she was one of the few statisticians who could take her head out of the numbers and evaluate the bigger picture of the work. And rounding out the team was Mike, who was a tremendously hard worker and had just got done building another credit model, so he was in the right frame of mind. My task was to re-build the late payment fee portion of the model. I didn’t want to cloud my judgement, so I didn’t even look at what variables were used previously so I could attack the problem objectively. I ran the data through CART, picked the best variables, and ran them through SAS to get an initial working model. Being the mid-2000s, mortgage data was very highly correlated to good credit risk customers. This was not surprising for the time – house prices were booming, and Subprime customers were paying back credit cards with cash-out refinancings – a cash source that was soon to dry up. I consulted with HJ on my findings, and we decided to remove many of the mortgage variables to remove bias from the model (a decision that would prove wise and beneficial for Capital One as the mortgage market melted down and Capital One emerged as perhaps the most resilient consumer credit company in the nation). When we felt confident about the revised model, we used backtesting to ensure the model performed well – i.e. used sample data to see if the model actually worked. I was quite surprised with the results from the model and backtesting: a higher late payment fee didn’t necessarily equal greater profits (or even greater revenue). I had anticipated the late payment fee impact would be close to linear – the higher the fee, the more revenue and profit. I figured the more we could charge, the better, and the main constraint would be that customers wouldn’t sign up for a card with a high late payment fee (these were the days before the CARD Act that capped the late fee). My hypothesis was that raising the fee would increase the profits from any particular customer, but may drive a decrease in the number of total customers. HJ and I found out, though that the amount of the late fee has a parabolic impact on profits at a customer level. There’s a tipping point, and once the fee exceeds that amount, profit actually declines. The fee becomes so onerous that customers stop paying their bills, resulting in losses for Capital One. Again, these were Subprime borrowers, many teetering on the brink of default anyway, and a $39 late fee vs. $29 could be the difference between solvency and default. But it’s a stark difference to my hypothesis – that raising the late fee can create capital losses. The end result was that we didn’t use the highest late fee in all circumstances. For some borrowers, it was better to actually have a lower late fee. And, it brought about a new credit policy on late fee waivers – Capital One led the charge in proactively and re-actively waiving late fees, both to drive loyalty as well as reduce losses. Gary was very happy with the result of the model and the impact on the business. He got his promotion, and ended up leaving Capital One a short time later for another step-up. Mike had the unenviable task of splicing the various pieces of the model together, and worked hard and kept his smile on his face. HJ moved on to the next big model needing a rebuild. An I went back to customer acquisitions and portfolio management. But there was another, meta-takeaway I took with me from the experience – the law of unintended consequences, particularly around credit risk. Higher fees and interest don’t always yield higher profits. It’s one of the reason at Peer Lending Advisors we look at both the interest rate (expected revenue) and risk of loss (expected capital loss) to create our model for expected loan profitability. Chasing returns is for fools – if we don’t think we can make a fair return on our capital, we sit on the sidelines. And we tread carefully where interest rates are above “D” grade, knowing the risks of customers in these classes. Interested in leveraging the experience of Peer Lending Advisors to help guide you through Peer-to-Peer Lending? Call (425-246-5436) or drop a line – Peer Lending Advisors would love to work with you. What does this mean for banking? The Fed’s easy money policies have meant plenty of cash chasing fewer loans in banking. This signal from Titan and Congressional is that the banks are sitting on piles of cash. They don’t have enough loan demand to profitably deploy their cash, so they’re looking elsewhere. While the Fed has said they will taper their quantitative easing policies, experts believe the Feds printing presses will remain on for the foreseeable future. Titan Bank and Congressional Bank are saying they will stop underwriting some loans and let Lending Club do the heavy lifting of approving loans and assigning interest rates. This was the most surprising part of the announcement for me – Local Banks historically have had a competitive advantage in underwriting: knowing their customers and the local environment better than national banks. However, this signals that some banks are giving up. 3. Local banks still have competitive advantage in access to cheap funds. 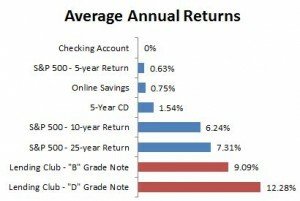 Checking accounts don’t pay any interest, and savings accounts offer virtually nothing to depositors. This means cheap cash for local banks – cash that has been historically been more difficult and expensive to acquire nationally (online banks offer almost 1% interest to depositors). Take, for example, monoline credit card companies like the mid-2000s versions of Capital One, MBNA, and Providian. Those companies didn’t have cheap access to funds and instead had to rely on the market to fund their credit issuances. If (and when) the credit markets locked up, the companies were toast. Capital One survived (partially through acquiring local banks like Hibernia and North Fork), and the others were swallowed up by other big banks. For Lending Club, it could mean improvement to their bottom line, or a push to improve market share by passing the lower cost structure on to borrowers. It will be interesting to see if and how Prosper responds. 4. Lending Club is taking the long-term view. While Lending Club’s current balance of P2P supply and demand is tilted towards too many investors and not enough loan demand, Lending Club is looking to grow both investors and borrowers. While Peer Lending Advisors’s clients would rather they focus 100% on getting more loans on the platform, it’s the right move for Lending Club as they work toward an IPO in the next year. Lending Club will need more cheap money. How could they do this? We could see more partnerships with local banks. Or, we could even see an acquisition, along the lines of what Capital One did in the late 2000s. Back when I worked for a large bank, I was part of a project to re-create our credit models to remove one variable that was deemed too risky to use anymore. In other words, I was making a new investing algorithm to decide who was approved and denied credit. Banks have been forbidden to “redline” for years – the process of refusing to lend to certain specific areas, usually determined by zip code. The reason this practice was banned was because banks used it to deny credit based on race – an absolutely horrible practice of prejudice. At the bank, our variable wasn’t used to redline. In fact, it was a fairly broad regional indicator that allowed us to weigh macroeconomic trends. But it was deemed too risky to use. As a result, our models became worse at predicting credit worthiness. Removing the variable cost the bank millions of dollars in profit each year – all because of a simple variable. What does this have to do with Peer-to-Peer Lending? When you invest in Peer-to-Peer lending, you can choose any geographies you want to invest in (or avoid). This is a big advantage for a discerning investor. Geography is an important variable in Peer Lending Advisors’ models, while banks can’t use it to their advantage. Peer Lending Advisors is more likely to invest in loans in areas that are doing well economically. For example, Austin, Texas, which has a booming economy. Similarly, Peer Lending Advisors is more likely to invest in areas that have benefited from the boom in Natural Gas exploration – those borrowers have good job stability. Peer Lending Advisors is less likely to invest in loans from economically depressed areas, like Detroit, Michigan, Harrisburg, PA, and many parts of California. Job prospects in these areas are lower. It’s not that these areas aren’t considered at all, but it takes a much better opportunity to consider loans in these areas – measuring risk and reward. Banks can’t discriminate based on location – in fact, by law they can’t even consider much of that data. But through Peer-to-Peer lending, you can, and that’s a huge advantage. Interested in learning more about how Peer Lending Advisors uses data like Geographical Targeting to make great data based investment decisions? Contact Peer Lending Advisors. Google made waves today when they announced a $125 M investment round in Lending Club, valuing the company at $1.5 B. What does this mean for Peer-to-Peer Lending? Less than a year ago Lending Club did a venture funding round that valued the company at about $500 million. Now they’re worth three times that. 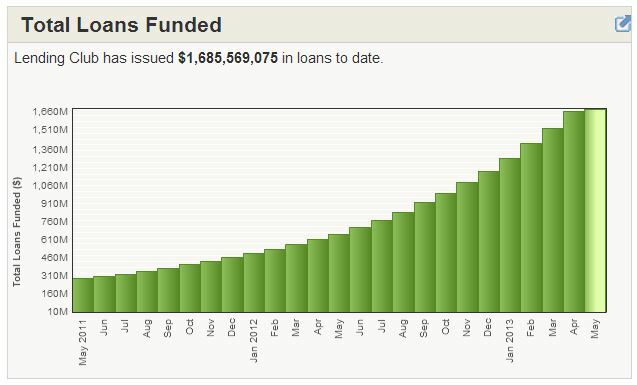 Lending club has issued $1.7 B in loans to date, and the growth trajectory is tremendous. Lending Club is here to stay and the Peer-to-Peer Lending model is a force. Google’s investment only reinforces this. Lending Club is ready to ramp up originations. Loans are being funded within hours instead of within days. The company needs to find more borrowers. Google is an online marketing machine, making the vast majority of their profit through online ads. They have perfected the art of presenting the right ad to the right customer at the right time. Lending Club needs to scale their marketing even further. They’re spending $11 M per quarter to generate their originations. They could leverage Google’s massive data capabilities to target customers better. Cutting their origination expenses by 10% would turn them from unprofitable to profitable. For a company looking to go public in the next 1-2 years, this is a must-do. 4. Is Google getting further into financial services? Google Payments have been around for years, and the Google Wallet feature on Android phones is a very convenient feature. Is Google planning on adding lending to their massive arsenal? Think about it. You’re at the car dealership and are negotiating a car purchase. Google Now on your phone can geo-spatially detect where you are, and pop-up an offer for a $10k car loan at 8% interest. Google already knows who you are, and could be a player in financial services by always being in your pocket. Walmart has jumped into financial services by applying (and being rejected) to start their own back, and having their own prepaid card. Google could be next. 5. Could Lending Club add social networking data to its proprietary lending model? 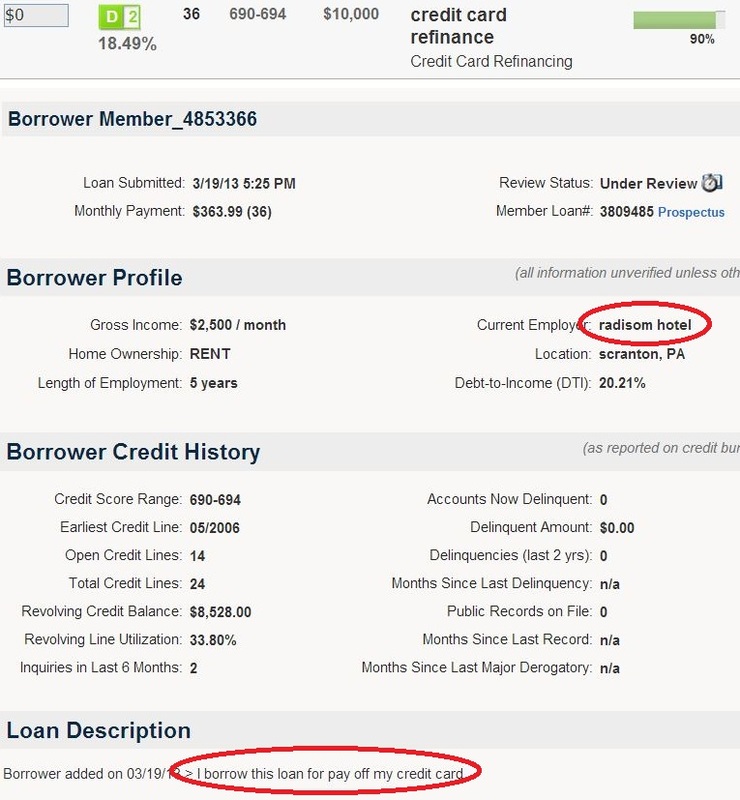 The possibilities for adding Internet behavior data to credit profile data is compelling. Can you imagine if the credit bureaus could access your Facebook data, see who your friends are, the types of posts you publish, photos, etc., and used that data to determine your credit worthiness. If you’re friends with a bunch of people with low credit scores, what does that mean about your credit profile – probably not good. Lending Club and Google could potentially partner to make this happen with Google+. While Google+ remains a virtual wasteland of activity, growth could ramp up and become a valuable data source. 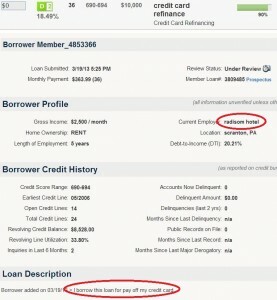 Misspellings in loan descriptions: Would you invest in these people? Other providers that offer managed investing in Peer-to-Peer Lending talk about their statistical models, but gloss over an advantage of Peer-to-Peer Lending that they’re not taking advantage of: rich, written descriptions of how the borrower will use the money. If it’s laden with typos and grammatical errors, what does that say about the underlying worthiness of the borrow? To me, it says stay away. Even if it was a careless mistake, this borrower is less trustworthy than a borrow with a similar profile but uses correct grammar. This borrow could have problems finding a new job should s/he be laid off, and could make other careless mistakes to put their job in jeopardy. Not the type of person Peer Lending Advisors invests in. The automated lending models that use a computer algorithm to select loans wouldn’t pick up this issue. However, a manual review of every loan did, and made the decision to not invest. This is an extreme example, but not unusual. This borrower works at the “Radisom” hotel and the loan description is not a legitimate sentence. It’s likely that this borrow’s first language is not English. To use such poor language in their loan application, and to even spell the employer’s name incorrectly does not inspire confidence. Do you want to loan your money to this person? Peer Lending Advisors sifts out the chaff like this loan and only invests in loans that meet computer model criteria PLUS a human underwriting review. Don’t get stuck with loans like these in an automated investing platform. Peer-to-Peer Lending is an exciting consumer lending opportunity. While the credit card democratized credit for the masses, Peer-to-Peer Lending has broken down the banker’s door. For consumers, it has cut out the middle-man, lowering interest rates and increasing access to credit. For investors, it has allowed access to debt that was previously only accessible to the largest banking brands on earth. 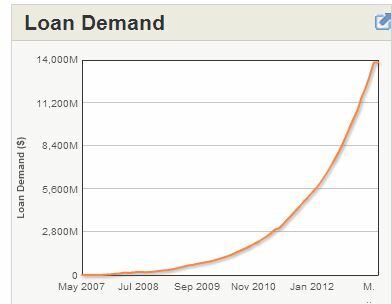 Source: finance.yahoo.com and Lendingclub.com March 2013. Peer Lending Advisors will customize your portfolio based on the yield you desire and your appetite for risk. For most investors, this includes managing not only the near term upside, but also the long-term downside. Contact Peer Lending Advisors to create the custom portfolio that meets your investment objectives.